Anvil Works® | Repair of "Newton's Dream"
This whimsical sculptural device attracts and engages people with rolling balls and percussion devices that clatter and chime. It was created in 1990 by artist George Rhoads for exhibition at The Franklin Institute science museum in Philadelphia. After display in several different configurations in several different exhibition halls, the machine began to show signs of wear. After more than 25 years of continuous vibration and impact, some steel tracks sagged and some welded joints broke. Balls would depart from their tracks, and several portions of the 14' x 14' x 5' sculptural machine became dy sfunctional. In 2015, The Franklin Institute commissioned Anvil Works to repair and refinish "Newton's Dream." 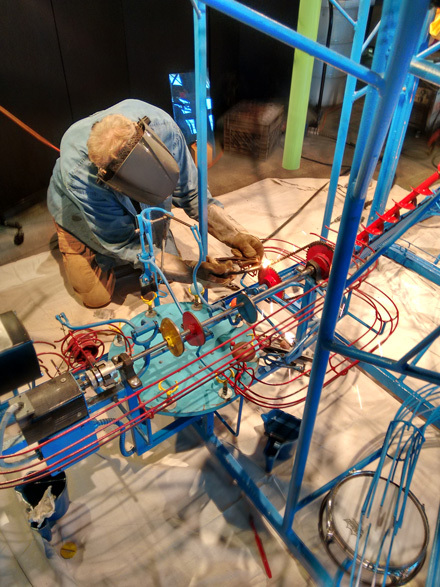 All work was done on-site in one week, involving safe and accurate public welding in a museum exhibition hall during open hours.